We spend a lot of time analyzing our business, but we need to ask whether we are looking at the entire picture or just scratching the surface. Are you looking for the big opportunities? Developing next year’s category plan? Identifying weaknesses when business is soft? Determining the next big innovation? Evaluating the post results from an initiative? Or analyzing a specific tactic? Identifying the question will help you achieve your goals. How am I leading this organization to address this highly complex, analytic approach? Inaction, or leaving it up to your different teams to figure things out, most often results in misalignment, inefficiencies, limited perspectives and ultimately, limited results. Today's blog gives suggestions on ways to move to more advanced analytics by providing more structure to your approach. Use these 5 tips to improve how your organization does category assessment. If you find your team or organization swimming in an abyss of data and tools, help is here. Based on CatMan 2.0, here are 5 ways to improve your analytic approach that will increase alignment, strengthen data & technology ROI, promote Shopper-focus and ultimately better business results. Increase the Value of Category Assessments throughout your organization. 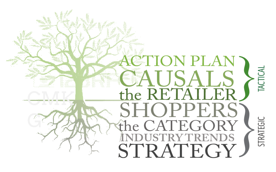 ... to get bigger category and Shopper perspectives, develop better, fact-based solutions and identify bigger opportunities ... Category assessments should be broadly used in organizations: for category reviews, business reviews, tactical work, and even brand health assessments. For Suppliers, if you tend to look at your Brand results in absence of total category insights, and are striving to find ways to sell in more stuff behind your brand vs competition, you’re missing a bigger category picture that will help you to be more proactive and make better, Shopper-focused solutions for your Brand and for the Category. This also applies to Store Brands. 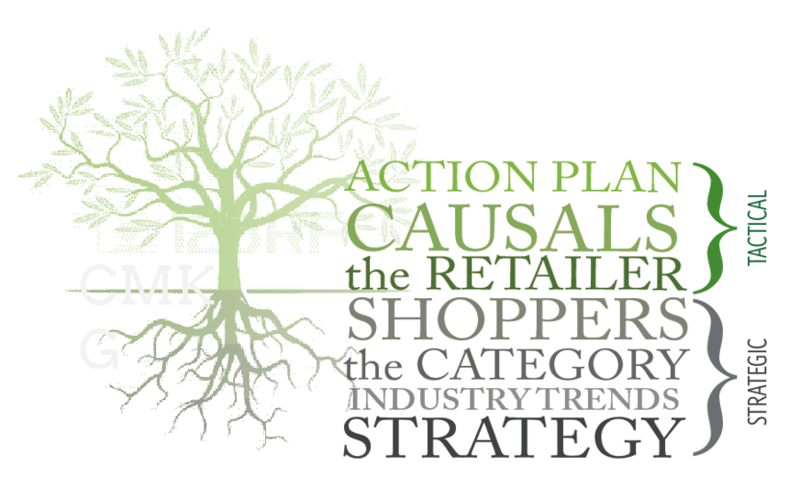 If you are completing tactical work (like an assortment analysis or planogram development), you should complete a category review FIRST to understand overall business, trends, Shopper – so that you can make strategic, Shopper-focused recommendations based on category insights. Without this perspective, you’re just doing tactical work. ... incorporate new Shopper data sources and perspectives throughout category assessments for better, Shopper-focused opportunity identification. DON’T FORGET THE SHOPPER in all category management work, but specifically you need to expand beyond a few slides about their demographics and a few purchase behavior metrics. Train your organization on Shopper data and Shopper insights, including where to access and how to use. Give broad access to Shopper insights data via an internal Insights Library. Develop standards & best practices in category management that incorporate Shopper data and insights in all key areas. Provide easy access to data — ultimately through data integration. Are you spending 80% of your time ANALYZING or GATHERING? It’s incredible how difficult it is for some CatMan professionals to access the data that they need in order to make decisions on their day-to-day business (assortment, pricing, promotion, space). Sometimes they need to even go to completely different systems to access pieces of the story that they then need to put together for insights. Sometimes this work is done haphazardly or without the full story because of the time required to get to the insights. The opportunity is to move to easier to access, integrated databases for flexible, fast and expandable access as your data evolves. Even if you don’t have complete data integration in mind, you should determine ways to give your team easier / better access to key data sources to encourage fact-based decision making. Then remember to teach the skills that will help them make better, fact-based decisions. We have more granular data and new data sources available, with new tools to go along with each new data source. critical thinking framework to teach folks how to navigate across a more complex pathway. Our model of the Analytic Pathways places the roots in strategic foundations that yield analytics. use of Shopper Perspective and Shopper Insights. I was recently conducting a live training session for a sales team at a national meeting and we were talking about the importance of having a purpose. Many of them realized they don’t really have a specific purpose when they develop their business reviews for retailers, beyond presenting the results from the past quarter or year. To develop a fact-based category plan or business plan for the upcoming year. If you are tasked with developing a category assessment, always ask what the purpose of the assessment is. The purpose will allow you to get to the right insights more quickly. And if you’re not familiar with the customer or recipient of the analysis, do some research to keep their best interests in mind. Without this perspective, you can spend too much time doing work that may be meaningless to your audience. To improve the approach to data analysis and analytical skills in your organization, you must understand the bigger picture, including the changes that have occurred within category management (CatMan 2.0). Take the first step by understanding how category management has changed by requesting a link to our category management training webinar, ’CatMan 2.0 Introduction: How Things Have Changed'.